Sint-Anna-ten-Drieëntriptiek met Theodoricus van Beest. Original location: Delft, Charterhouse Bartholomeusdal (inferred from text on predella, see remarks). Current location: Aachen, Suermondt-Ludwig-Museum, inv. no. GK 1526. Provenance: See auction catalogue Lempertz 30, lot no. 1316, 1995/11/15. Artist: Master of Frankfurt (central panel), Master of Delft (wings) (based on stylistic features). 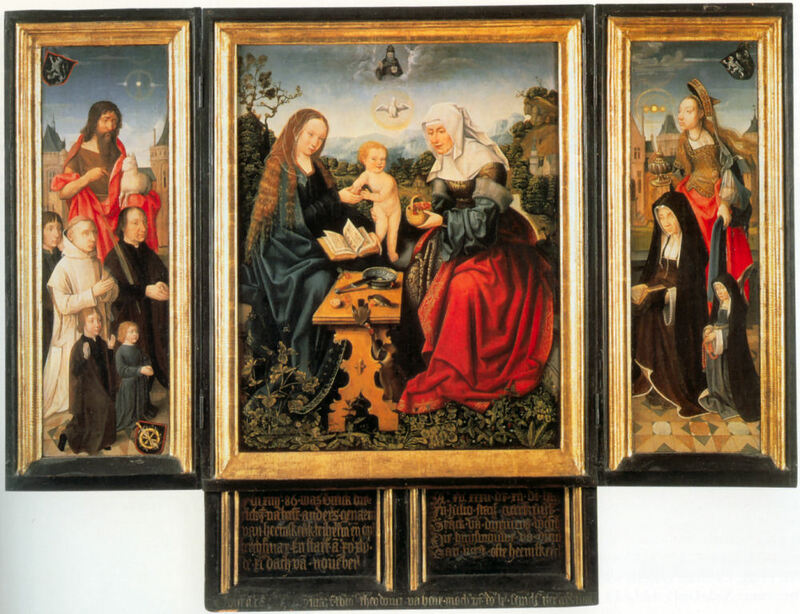 Short description: Triptych, with on the central panel the Virgin and Child with St. Anne (Anna Selbdritt) in a landscape, combined with the Holy Trinity. On the inside of the left wing five kneeling male members of the van Beesd van Heemskerk family, with Dirk van Beesd van Heemskerk up front. Behind them stands St. John the Baptist and the background displays a cityscape. In the upper right and lower left corner are two coats of arms. On the inside of the right panel two kneeling female members of the family, with St. Mary Magdalene, in front of a cityscape. In the upper right corner a coat of arms. The outside of the wings show, when the triptych is closed, St. Jerome in the desert. The predella contains texts about three family members. Coat of arms: Left wing, top left: High gothic shield - In black [blue] a red langued and nailed silver lion (van Beesd van Heemskerk). Left wing, bottom right: Semicircular shield - In black a golden Catharine wheel with a golden sword in bend over it. Right wing, top right: High gothic shield - Per pale I: in black [blue] a red langued and nailed silver lion; II: in black two silver halberds in saltire, gold shafted (Van Diemen). Text: On predella left: Anno xiiiic.86 was Dirick Dirrickz van Beest, anders genaemt van Heemskerck, te Iherusalem ende opt[en] berch Sijnay. En starf anno xvc.xlv de xien dach van november. On predella right: Anno xvc.xxxii den xii.den dach in julio starf Geertruyt Vranck van Dijrmens dochter, die huijsvrouwe van Dirick van Beest ofte Heemskerck. Lower edge of predella: Obiijt anno [...] 9 Mae frater Theo[dorus] Theodorici van Beest, monachus professus domus huius sepultus inter fratres suos". General remarks: The central panel, from another artist than the wings, might have been bought at the yearly market in Delft, after which the wings were ordered to be made and added by a different local painter. This might have been done at the occasion of Dirk, the son of Dirk the Jerusalem pilgrim, entering the Charterhouse in Delft in 1517. The text on the lower edge of the predella mentions him being member of the Charterhouse, and he is displayed kneeling behind his father in a habit. In that case, the predella must have been added later, since it mentions the deaths of Dirk the father (1545), Dirk the son and mother Geertruid (1532). Bron: Deelse beschrijving volgens http://memo.hum.uu.nl/jerusalem/pages/32.shtml (zie daar de volledige informatie). 1. Volgens L. Zuidema, 'Memoriestuk van de Delftse familie Van Beesd', in: [Pansters 2009a]196-197, dateren de zijluiken van 1514, de predella van ca. 1606.